An elaborate system of Naval defences was planned for Lyttelton Harbour. This included systems to detect vessels passing into the harbour, both on the surface and submerged as well as a mine field and a boom across the inner harbour entrance. An observation station for the mine and detection systems was intended for Godley Head. However the naval defences were cancelled and work stopped on the station with only part of it built. One timber accommodation building and one oil store shed had been built but were removed after the naval defence systems for Lyttelton Harbour were cancelled. Some initial work had been done on laying detection systems and the boom across the harbour at HMS Tasman Shore Training Establishment was installed but the mine field was instead laid at Akaroa Harbour to protect the mine store there. 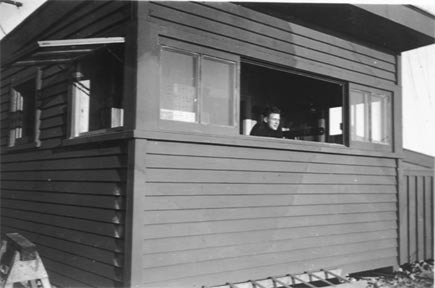 A Port War Signal Station was erected directly behind the 60 pounder emplacement. It was housed in a number of pre-fabricated huts and was manned by a Royal New Zealand Navy Unit. The purpose of the station was to identify ships approaching or departing from Lyttelton Harbour and to issue permission to proceed. Initially the station liaised directly with the Battery in front of it as well as through the Lyttelton Naval Command to the examination batteries located at Fort Jervois and Battery Point. After the six inch naval guns were installed at Taylor Battery it was found that their muzzle blast shattered the fibrolite cladding on the station buildings. To avoid this problem the station was moved further up the cliff edge toward Godley Battery and the huts were reclad in weatherboards. The Naval personnel were accommodated in a barracks slightly inland of the Signal Station. After the station was moved, it seems that all communication took place through the Lyttelton Naval Command.